Once you’ve gotten a hold of using shaving cream in your daily routine, you may want to try out the best shaving soap to see which of the two feels better for you. These two are very similar in many ways but feel very different and give you different types of lathers. Trying both out should be a good way to know which one you prefer. Using soap takes a bit more practice since building a lather here takes a bit more learning compared to that with cream. What you’ll get is a sleeker feeling compared to cream. 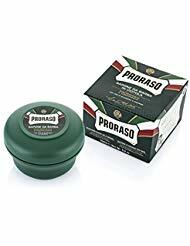 Proraso shaving soap is an Italian made shave soap that has both eucalyptus & menthol. One container is 5.2 ounces. This is a new formulation for Proraso and all you have to do is whisk it with your favorite shaving brush, lather up, and shave. You can then rinse with cold water and enjoy a smooth, cool feeling face. The process for making it is similar to making hot soap, and before it is put into the bowl, it is left to mature for a full 10 days so that it is very concentrated. This means one tub will last you a long time and makes it one of the best shave soaps on the market. 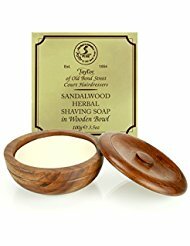 If you enjoy a sandalwood scent, then perhaps Taylor of Old Bond Street is the soap you’ll want to use for shaving. One 3.5 ounces hard soap bowl is scented lightly with sandalwood, cedar, lavender, and rosemary, as well as jasmine and rose. This ends up being a very masculine scent that when warm, it is much stronger than it is when you put it on your face. However, it will be noticeable. It is also very long lasting according to the people who love it. It lathers up well to give everyone who uses it a close shave that will not irritate your face. If you have never tried Col. Ichabod Conk’s glycerin soap, now is a great time to give it a try with this four pack variety pack gives 2.25 ounces of four unique scents. You can choose the one you like the best or save with each depending on your mood. There is lime scent, bay rum, almond, and amber for you to choose from. 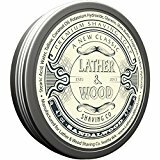 This company has been around for 150 years providing men with a quality hard soap which will meet all of your shaving requirements. That is why they have been voted as the best shaving soap manufacturer by many. Perhaps you should also give it a try to see which of these four scents you enjoy the most. Either way, you will have enough lather to comfortably shave with either a safety razor or a straight razor blade. Van Der Hagen Deluxe shave soaps come in a 2.5-ounce box. You get a pack of twelve on Amazon for one low price. It is perhaps the best shaving soap for anyone who has to deal with dry skin after shaving. Click to take a look at this deluxe soap for shaving from Van Der Hagen. It is enriched with 40% moisturizing aloe vera and shea butter. It works well to soften the hair of your beard and your face so that you will always have a smooth and comfortable shave. As an bonus, the aloe vera and shea butter also help your face retain its natural moisture so that your face feels comfortable and smooth long after the razor has been put away. It is also hypoallergenic, and it is never tested on animals. For the most part, there’s a bit more hesitation with using shaving soap compared to shaving cream. That’s probably because most of us are used to seeing our dad or someone we know use cream when shaving. How to lather shaving soap is a bit different from cream in that instead of putting a small amount of cream and start swirling it, you’ll be starting off by swirling your shaving brush over the soap before transferring to the shaving bowl. Here’s a video demonstration of the process. As a summary of the steps, here’s how to get a lather with shave soap. Dampen the shaving brush. If you’re used to using shaving cream, you’ll need to dampen the brush a bit more than you would when using cream. Take the soap bowl or container and start swirling the brush over the soap. You’ll be creating the lather on the soap itself. This step is similar to applying soap when washing our hands, where you need to rub your hands together to produce lather. Once you get this, transfer the brush to your shaving bowl and continue to swirl until you get the foamy consistency. Add water or more soap as needed. Apply the lathered brush to your face then start your shave.